But along the way, he establishes two even more sweeping arguments, both of which tell us something important about the mess in which Europe now finds itself. He shows that the growth in inequality has its roots in an ideological shift that swept the western world from the late 1970s onwards. And he shows that, long before 2008, that ideology had spectacularly failed to deliver any of the promised benefits. The story of the 2008 financial crisis begins with an intellectual counter-revolution. As western economies laboured under the 1970s oil shocks, inflation and industrial strife, the ideas of free-market economists such as Friedrich von Hayek at the LSE and Milton Friedman in Chicago found an attentive audience on the Right. The Keynesian welfare capitalism of the post war years, they argued, required substantial state control over markets, which killed enterprise and stifled incentives. With less government intervention, efficient markets would be self-correcting; resources would be accurately priced and allocated. The counter-revolution was spectacularly successful. The faith in markets which had long been the province of an ideological fringe quickly became the new orthodoxy. The doctrines of the neo-liberal counter-revolution were energetically applied by Rightwing governments, starting with Thatcher and Reagan and soon, to varying degrees, through the western world. The impact on the distribution of national income was swift and dramatic. In the UK, the income share of the top 1% more than doubled in 20 years to 10%; while the share of the bottom three-fifths fell from 40% to 33%. The ratio of CEO pay to the average of all employees was 25 to 1 in 1981, 100 to 1 in 2006. The share of wages in national income fell back to the levels of the 19th century. The trend was worldwide, though much stronger in the UK and – above all – the USA, where the intellectual grip of neoliberal economics was tightest. But the shrinking share of wages in national income created a new problem. Household consumption accounts for around two-thirds of GDP. If for 30 years the economy grows faster than wages, who will buy the output? Not every country can export all its surplus production. The solution was credit. From 1980 to 2008, household credit in the UK for example grew from an average 45% of income to 157%. Retail sales in the years before the bubble burst were growing three times faster than incomes. And the newly deregulated financial sector was only too happy to feed the habit. At the other end of the scale, the vast cash surpluses generated by the growing profit share was fed further by fortunes made from privatisation, deregulation of financial markets and a friendlier and more porous tax system. All this money had to find a home, and a return. But instead of going into productive investment, as the theory had promised, it fuelled asset price bubbles – notably in housing – and generated an explosion in financial engineering, which became the principal activity of the financial sector. During this period, finance’s share of US corporate profits grew from 14% to 40%, while in the UK it reached over 30%, the product of political patronage, deregulation and the huge financial surpluses created by the growing fortunes of the super-rich. Its activities became ever more divorced from the productive economy and ever riskier, as institutions responded to distorted incentives and to the market imperative of ever higher profit. As Lansley shows, there was no shortage of warning voices, from dissenting but distinguished minorities among economists, regulators, business people, IMF. But the final link in the trail leading from free market ideology, to growing inequality, to financial disaster concerns regulatory capture. Simply, the financial sector became rich and powerful enough to buy the political system. Whether literally, as in the USA, or more subtly in the UK, where the riches of the City led a bedazzled New Labour into a Faustian pact: light-touch regulation in return for swelling tax revenues. (The Tories, of course, who started it all with the Big Bang, were still shouting from the sidelines for even less regulation just months before Lehmann went belly-up). 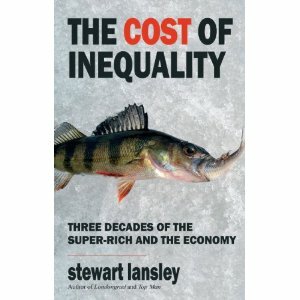 Lansley’s book shows not only the dysfunctionality of a swollen financial sector and the causal link from inequality to financial collapse. He shows how market-worship created and legitimised a more widespread corporate culture in which personal enrichment became steadily more divorced from any wider economic benefit. The maximisation of shareholder value supplanted any notion of wider corporate responsibilities. The convenient belief took hold that since remuneration is the market’s infallible measure of what you’re worth, there can by definition be no such thing as over-paid. Together these principles produced a short-term, opportunistic, spiv economy. Big profits were made not through the slow, hard work of investment, research or production but through hostile takeovers, corporate raids, leveraged buy-outs. As Lansley shows, such activities became more and more central to corporate culture, destroying many fine companies, shedding employment, adding nothing to economic efficiency, but providing a huge personal gravy train for wealthy investors, CEOs, City financiers and their banking and legal advisers. ‘The Cost of Inequality’ shows that the market capitalism of the last 30 years has been an enormous scam. A dodgy brand of free-market economics achieved an undeserved intellectual hegemony which has served to legitimise a Right-wing project of shrinking the state, zapping the unions and turning a new generation of robber barons into masters of the universe. It has thrown social democracy into confusion, giving us three decades of ideological uncertainty, compromise and triangulation by social democratic parties and governments. Now, three years after the catastrophic failure of the economic system which the Right had constructed, cherished and defended over 30 years, both the Right and the system itself seem more firmly in the saddle than ever. The banks are richer than ever; the state is at the mercy of the financial markets. Social democrats are on the defensive and largely marginalised from the European debate over crisis and recovery. As Keynes said of an earlier crisis, it is not new ideas that are the problem, it is getting free of old ones. Despite the meltdown of the financial sector, the mainstream dominance of free-market groupthink is undiminished. In Brussels, for example, the very notion that inequality rather than alleged public extravagance is the key to systemic weakness and should be the central concern of economic policy-making would be derided by both Commission and Council. And the rhetoric of liberalisation, wage restraint, competitiveness and market forces is still woven into their every economic document. But what Stewart Lansley shows is that the collapse of financial markets was not an aberration, but in fact the direct consequence of a dysfunctional economic system based on an ideological fairytale about how markets work. 2008 should have been, perhaps briefly was, a left-wing moment. But the Right has managed to change the subject. The crisis is no longer about a dysfunctional model of capitalism but about sovereign debt crises and government profligacy. For now, 2008 seems to be the turning point where history failed to turn. But the battle is not yet played out. Across the developed world there is a powerful anger against bankers, against excesses of wealth and poverty, against a political system which does not deliver the goods. This could yet become a left-wing moment, if the left has a convincing story to tell. If there’s a message for social democrats in The Cost of Inequality, it is the power of ideas. The triumph of an economic ideology in the early 1980s has reversed half a century of social progress, empowered the Right, cowed the Left, created Victorian levels of inequality and hoodwinked us all. To bring about a radical shift in political direction, we have not only to attack the excesses of the financial sector – the epiphenomena, as Stewart Lansley calls them, of market capitalism. We have to discredit the entire intellectual edifice. First step: make everyone you know read this book. Especially if they work in the Commission.